From December 3-9, several cultural venues in the Chichester area are offering free entry and benefits to National Lottery Players. Spokeswoman Sarah Jackson said: “Pallant House Gallery and Weald and Downland Living Museum will be throwing open their doors for free to National Lottery players between December 3-7 while visitors to Chichester Festival Theatre will receive a free book telling the story of the Festival Theatre between December 3-8. “This December hundreds of National Lottery-funded visitor attractions across the UK are saying ‘thanks’ to people who have raised money for good causes by buying a lottery ticket. To take part, visitors simply need to present their National Lottery ticket or scratchcard at each venue to receive their reward. “Pallant House Gallery is offering National Lottery players free entry to the Gallery from Monday 3 to Friday 7 December. The Gallery’s award-winning contemporary wing, designed by Long & Kentish architects in association with Colin St John Wilson in 2006, was largely funded by the Heritage Lottery Fund. A recent major grant allowed the Gallery to make substantial changes to its digital infrastructure, underpinning the launch of the new website, which will greatly improve visitor experience and eventually allow better access to their collection. For further details, including terms and conditions, visit http://pallant.org.uk/your-visit/thankstoyou. 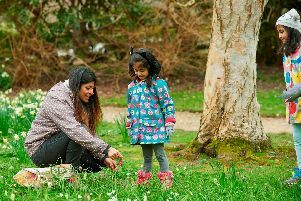 Weald and Downland Living Museum is also offering free entry to the Museum between December 3-7 2018 for National Lottery players. The Museum’s stunning new visitor centre, which opened last year, was partially funded by the Heritage Lottery fund. Anyone who brings a Lottery ticket to Chichester Festival Theatre from December 3-8 will receive a free copy of the beautifully illustrated book ‘Restored, Refreshed, Renewed’ which tells the story of the Festival Theatre’s rebirth. There’s also the chance to enter a competition to win one of three pairs of tickets for a free backstage tour of the Theatre in January, February or March: going behind the scenes of the iconic Grade II* listed building and following in the footsteps of the famous actors to have trodden its boards, from Laurence Olivier to Ian McKellen, Lenny Henry and Imelda Staunton. Chichester Festival Theatre’s redevelopment in 2012, RENEW, was partly funded by the Heritage Lottery Fund and also funded Pass It On, a three-year community participation programme charting the history of CFT and creating an archive that celebrates the past 50 years. For more information, please visit each venue’s website or http://www.hlf.org.uk/thankyou/map for a searchable map of all the venues taking part in the campaign. National Lottery players raise, on average, over £30 million each week for projects all over the country. In total £37 billion has been raised for Good Causes since The National Lottery began in 1994 and more than 510,000 individual grants have been made across the UK, the majority (70 per cent) of which are for £10,000 or less, helping small projects make a big difference in their community! Pallant House Gallery is a unique combination of an historic Queen Anne townhouse and contemporary extension, housing one of the best collections of Modern British art in the country. Widely acclaimed for its innovative temporary exhibitions and exemplary Learning and Community Programme which has inclusion at its heart, the Gallery has won numerous awards since re-opening in 2006, including the Gulbenkian Prize, the largest for arts and cultural organisations in the country. Chichester Festival Theatre is one of the UK’s flagship theatres, renowned for the exceptionally high standard of its productions as well as its work with the community and young people. The Festival Theatre’s bold thrust stage design makes it one of England’s most striking playhouses – equally suited to epic drama and musicals. Its studio theatre, the Minerva, is particularly noted for premieres of new work alongside intimate revivals. The Theatre runs a Learning, Education and Participation (LEAP) programme that is a beacon of excellence and inspiration to its local audience, as well as being home to one of the country’s largest youth theatres with over 800 members.